The YMCA of Greater Montgomery is marking Child Sexual Abuse Prevention Month with Five Days of Action, April 22-26, 2019. 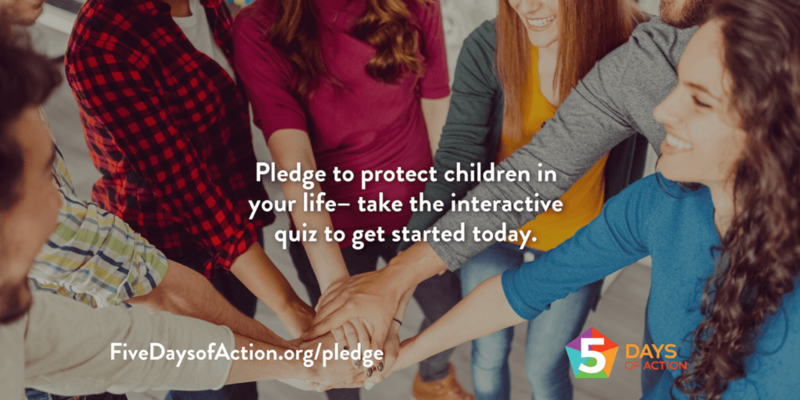 Leading up to Healthy Kids Day®–a national initiative to improve the health and well-being of kids–Five Days of Action focuses on preventing child sexual abuse by sharing tips on how adults can prevent child sexual abuse. During April and all year long, The YMCA of Greater Montgomery encourages adults and organisations in the community to play a vital role in making Montgomery a safer place for children. This year’s Five Days of Action theme is “Know. See. Respond.” When adults know how abuse happens, see the warning signs, and respond quickly to prevent abuse, they foster a culture of child abuse prevention. YMCA of Greater Montgomery and the YMCA Guardians for Child Protection, with support from YMCA of the USA, Darkness to Light, the Redwoods Group Foundation, and Praesidium have made materials available to help adults learn more about preventing child sexual abuse. For more information about preventing child sexual abuse visit the 5 days of action resource page.